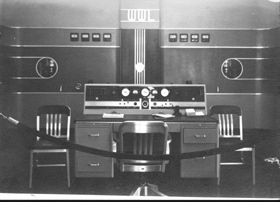 We have just begun to construct this web page for memories of WWL radio and TV. The new page will be filled with memorabilia about WWL radio and TV from their ealiest days to the present. 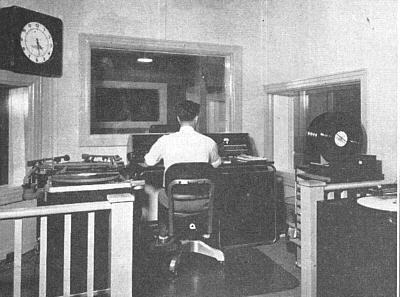 Anyone who worked at the WWL facilities or anyone who just wants to add to the site should email Charlie Matkin at broadcastmuseum@neworleans.com. We hope to add a lot of pictures, etc. in the near future. Thanks for your interest. 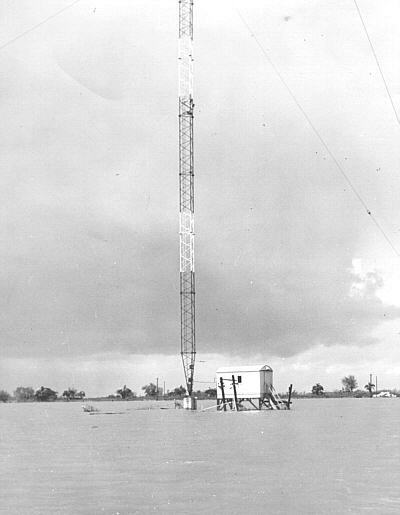 WWL, first "permanent" and commercially successful radio station in New Orleans and Louisiana, was franchised, according to FCC records, March 31, 1922. 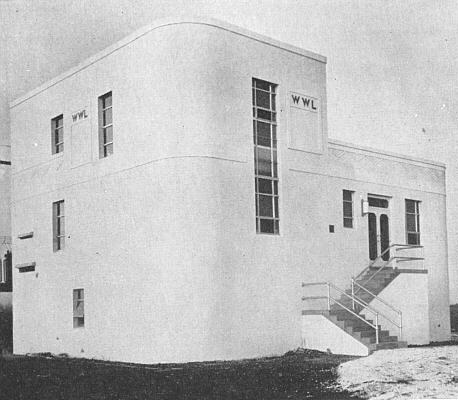 The first station in New Orleans to be franchised by the U. S. government was WGV, established by the Interstate Electric Company of New Orleans, on March 21, 1922. 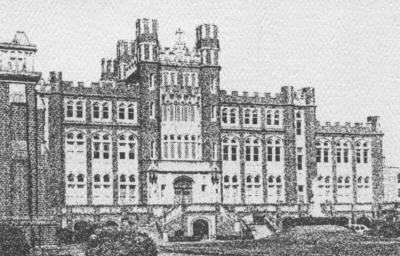 In that same year WJBO was authorized on April 4 (later moved to Baton Rouge),WAAB, owned by the Times-Picayune, was franchised on April 17, WAAC, owned by Tulane University and WBAM,owned by I. B. Rennyson on April 24. 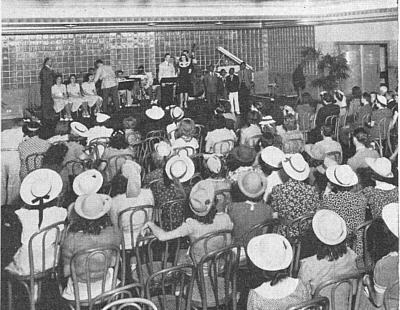 WCAG established by the New Orleans States newspaper was franchised on May 5, 1922. 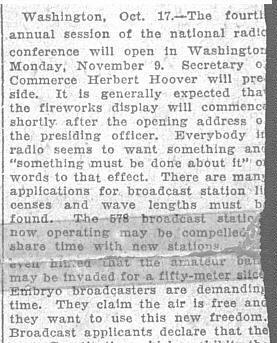 The picture above is a scan of a fragment of the Sunday, October 25, 1925 newspaper. It was found in the trash thrown out by the new owners of WWL radio when the station was sold by Loyola University. It was sent to Paul Yacich by the person who found it. 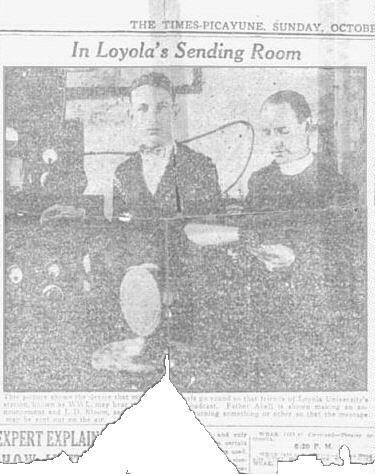 The picture shows Father Orrie Abell of Loyola University and J. D. Bloom (recently graduated from Jesuit High School - Class of 1925) who eventually became WWL AM-FM-TV Chief Engineer and the 10 watt WWL of 1922 became a 50,000 watt Deep South powerhouse clear channel station heard nationwide and as far as the Hawiian Islands. 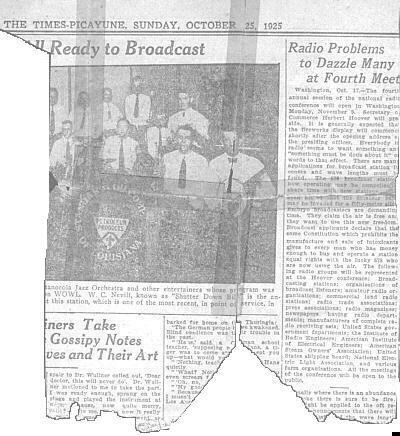 At the lower right corner of the clipping is a smidgeon of the Times- Picayune's radio schedule. Note that it shows programs from stations all over the country. Since there were few stations (578) it was easy to listen to the distant stations (Broadcast band DXing). Mentioned in the clip are WEAR at 389.4 KC (Cleveland), WEAF at 490.5 KC, WEEL, WWJ and WCAE. 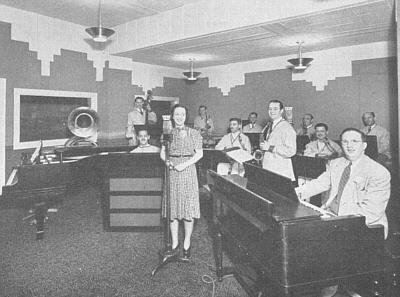 The other side of the 1925 Picayune fragment shows part of a picture of a jazz orchestra whose program was heard on WOWL. The clip mentions an announcer named W. C. "Shutter Down Bill" Nevill. 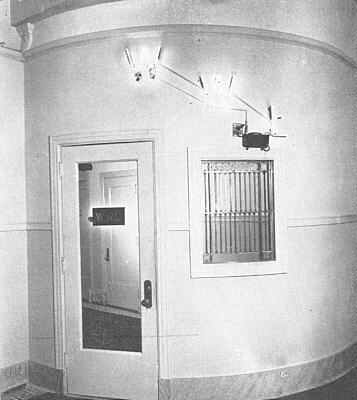 The picture announces "WOWL Ready to Broadcast" and indicates that the station is the most recent (authorized in July of 1923) in New Orleans. 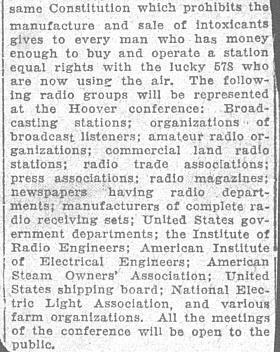 WOWL broadcast with 100 watts on 1110KC and was owned by the OWL BATTERY COMPANY. 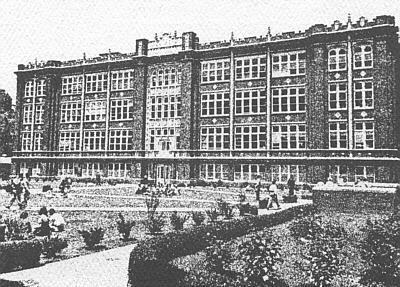 The station closed in 1926 and the call letters, WOWL, now reside elsewhwere in the United States. The article to the right of the picture is of interest to all broadcasters. It is shown in close-up below. 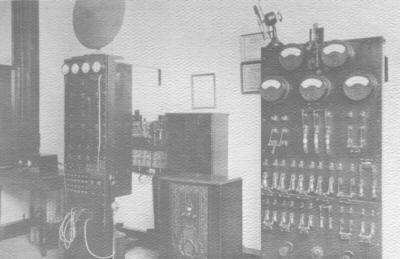 The two pictures above show the 5000 watt transmitter installation in Loyola's Bobet Hall. 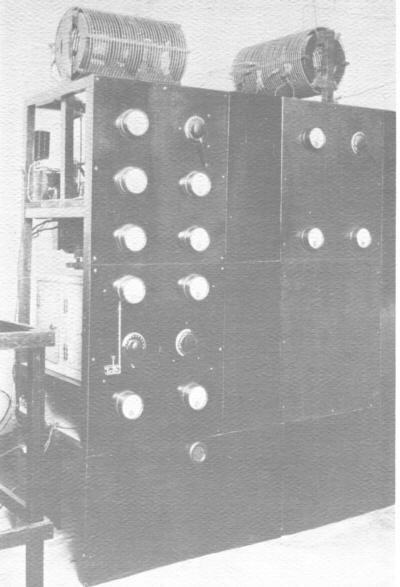 Special attention should be given to the high-tech cooling system in top of the transmitter power panel in the second picture. 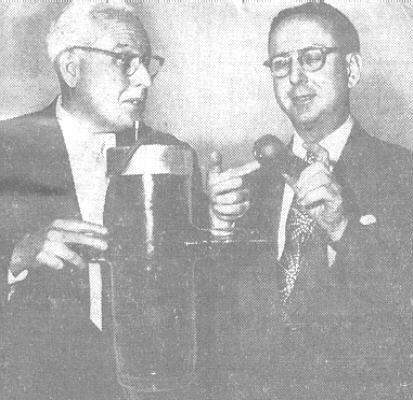 In the picture above, WWL Chief Engineer J. D. Bloom and WWL General Manager Howard Summerville compare the sizes of tubes used in WWL transmitting equipment. 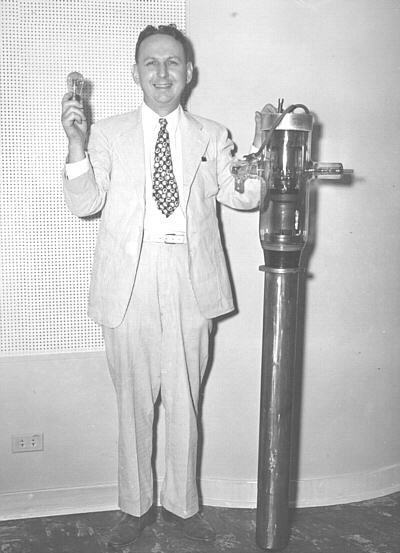 The tiny tube in Bloom's hand is from an early 10 watt transmitter used in 1922 when the station was broadcasting from a classroom at Loyola University. 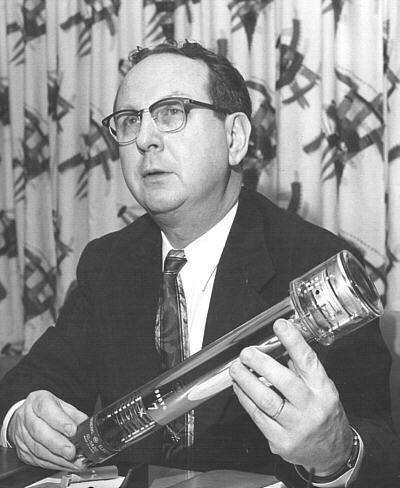 The giant vacuum tube held by Summerville is used in the high-power 50,000 watt transmitter. In the picture below, Jefferson Davis Bloom, shows the tubes in a better picture. 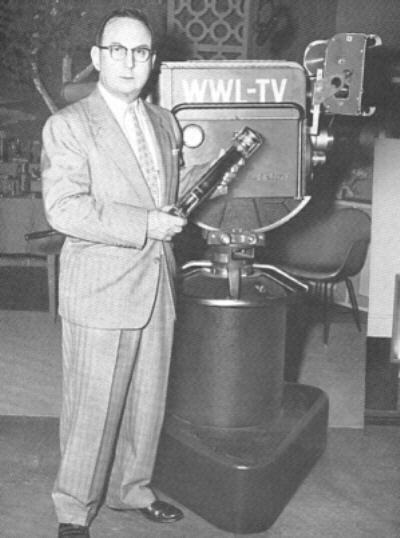 With the advent of television, J. D. took pleasure in showing an Image Orthicon, the picture pick-up tube of early television cameras as seen in the picture below. Here's J. D., again, this time in an ad for General Electric Image Orthicons As a matter of fact, J. D. was seen in so many pictures holding tubes he took quite a bit of kidding about it. He was told he should teach a course at Loyola in Tube Holding 101. 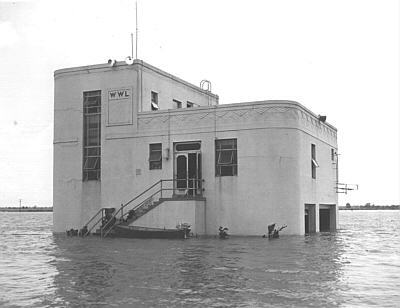 A newpaper story reports thet the Chief Engineer of WWL was in danger of drowning as he tried to reach the flooded WWL transmitter site in Kenner at the lakefront. 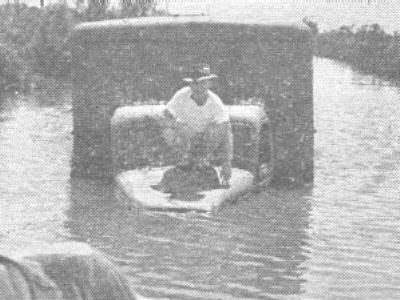 J. D. Bloom is shown in the picture below as he perched for 9 hours on the hood of a truck that stalled in the high water on Williamson Ave. near the lakefront. 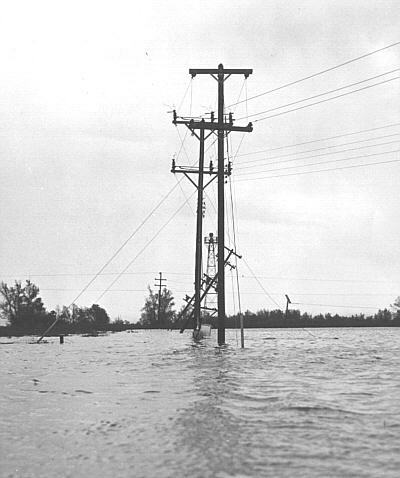 Pictured below are views of the WWL tower site, transmitter building and downed power lines in the rising waters of "Lake WWL" in Kenner near the edge of Lake Pontchartrain. WWL Transmitter building - in better weather! GO TO "NEW ORLEANS RADIO AND TV SHRINE"